StarCraft II may be popular in the U.S., but not the way it and its predecessor are in South Korea, where TV networks so badly want to air matches that a legal battle with Blizzard Entertainment could be heating up. StarCraft-maker Blizzard Entertainment, the Korea Times reports, isn't happy with the continued attempts by Korean cable channels to broadcast StarCraft matches. Once a sign of just how huge StarCraft was in Korea, TV airings of matches are something Blizzard has backed away from since the spring when it signed an exclusive deal with an online video service. The company will allow its new partner to negotiate new TV deals. Blizzard's relations with the Korean e-Sports Players Association have also fell soured. 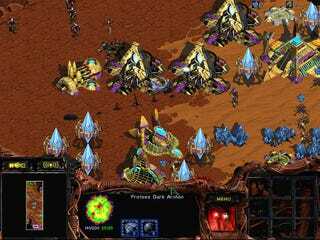 Yet the cable channels and the players' association have continued to air StarCraft matches beyond any previous agreements with the game company. That prompted Blizzard chief operation officer Paul Sams, the Times reports, to say at last week's Blizzcon that a lawsuit against the channels and the association is in the works. Blizzard wants to be paid more for its intellectual property, which it claims hadn't been properly respected over the years, while KeSPA [the players association] claims that the company is asking too much. Gretech-GomTV [the online video service] has currently been offering cable television firms 12-month contracts that demand broadcasting fees of 100 million won ($89,000) per league. The cable firms have been operating about three StarCraft leagues per year in both individual and team competition. Of course, this is a sign of just how popular Blizzard's game is in Korea. Games still aren't that popular on U.S. TV where even gaming-centric network G4 can be at risk for losing its spot on a major satellite provider DirecTV.